Therapeutic drug dependence occurs with psychiatric drugs. Although these drugs produce no tolerance and no euphoria, they produce enduring post-discontinuation changes that are as extensive and long lasting as the changes underpinning current disease models of addiction. Patients also get withdrawal or discontinuation syndromes when they stop taking their medication or when their medication is lowered in dose. When anti-depressant or anti-psychotic medications have been in the brain for a while and then the dose is suddenly lowered, or if the medication is taken away too quickly there is a reaction to that change called Neuroleptic Discontinuation Syndrome. So when a patient runs out of medication or is suddenly put on a lower dosage they can demonstrate exacerbations of psychosis, become delusional or even hallucinate. Seizures can also occur from rapid withdrawal from these psychiatric medications. The danger of withdrawal from antidepressants and antipsychotics is well documented. The brain compensates for the blockage of the serotonin and dopamine receptors by growing additional receptors for these neurotransmitters. When the medications are discontinued or suddenly decreased, these additional receptors contribute to 'overload' of serotonin and dopamine flooding the receptor. This is known as distcontinuation syndrome. 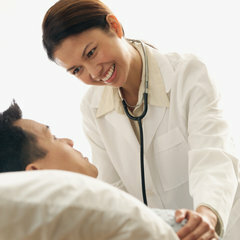 What usually happens to the patient in withdrawal is that they end up back in the hospital again. These crisis admissions lead to being labeled with a new disease diagnosis – schizophrenia, or delusional or manic depressive and then placed on even greater dosages of even more dangerous drugs. The doctors in these instances are quick to blame the patient, for a relapse rather than considering when the patient last took his medication. Discontinuation syndrome can sometimes last for weeks or months - some people have said they can last as long as six months. When trying to withdraw from many psychiatric drugs, patients can develop serious and even life-threatening emotional and physical reactions. In short, it is dangerous not only to start taking psychiatric drugs, but also can be hazardous to stop taking them. Therefore, withdrawal from psychiatric drugs should be done under clinical supervision. Clinical Case of young girl age 5, two days after STOPPING an antipsychotic. She developed Tardive Dyskinesia (TD) after the antipsychotic, called Invega, was stopped. She was only on 6 mg for one month, but has been on antipsychotics since she was 18 months old due to severe self-injurious behavior and aggression (including Risperdal, Geodon, Abilify, Thorazine, Seroquel, and Zyprexa). PLEASE understand the risks of antipsychotics before agreeing to give your child, or yourself, this class of drugs. Not only can abnormal movements occur while TAKING them, but (rarely) you will ONLY know you have Tardive Dyskinesia, or Extrapyramidal Symptoms, after you STOP these drugs. I am NOT giving you medical advice. You should talk to your doctor before starting or stopping any medicine, especially antipsychotics/neuroleptics.